DUMBARTON are still looking for their second Ladbrokes Championship win after a closely contested battle with Dunfermline Athletic. DUMBARTON are still looking for their second Ladbrokes Championship win after a closely contested battle with Dunfermline Athletic in front of a 1,016 crowd at the Cheaper Insurance Direct Stadium. Alan Johnson's side, in 8th place, had the majority of possession, but 9th placed Sons fought hard throughout and earned a valuable point. Despite the Pars controlling possession in the first half-hour, Sons took the lead in 37 minutes when a Robert Thomson driven cross was converted by his namesake Joe. But five minutes into the second period Dunfermline found themselves level. Confusion in the Sons defence allowed Nick Clark an easy header to equalise. 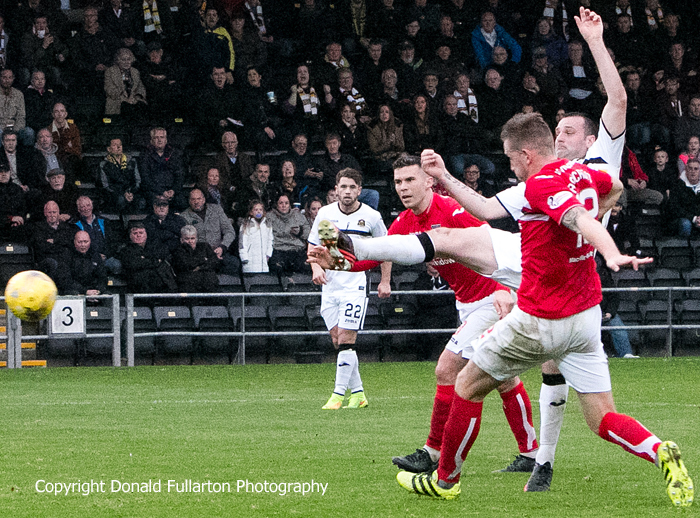 Substitute Joe Cardle gave the Pars a 2-1 advantage in 81 minutes with Sons looking defeated at that stage. However Daniel Harvie and Fleming combined just two minutes later with the latter controlling the ball then smashing home from six yards (pictured). In the dying minutes the home side pushed for a winner, but it ended with honours even.